Showing results for tags 'brass'. Melting HUGE amounts of Brass with impurities. I operate a rifle range, have for about 20 years, and until about a year ago we would leave the brass casing from the ammo on the ground or piling it. I have tens of thousands of pounds of brass, aluminum, and steel casings piled up now. So we decided it was time to begin sorting it, and taking it to the scrap yard, yielding about a dollar a pound for the brass, which 80% of it is. So it has to be sorted out before they will take it. We have been shoveling the brass into 5 gallon buckets, pouring it on a sorting table, running a magnet through it to remove anything magnetic, removing all rocks (amount of rock ranges from 25% to 0%) by hand, and removing all aluminum by hand; leaving us with buckets of rock, buckets of aluminum, buckets of steel, and sweet, sweet buckets of brass. The 0% rock buckets of brass I can sort 50 pounds in about 30 minutes. But the rockier stuff can take an hour or two for the same weight, and I simply don't have time, and despite the awesome pay, I'd rather never sort another bucket of brass again in my life. Its a terrible, mind numbing, depressing task. Wondering if there is a way to throw it all in something that can hold 500 pounds of the mixed product, and separate it all for me using heat. If you haven't already figured this out, I know nothing about this kind of thing other than different metals have different melting points and that what I am asking for is NOT easy if not impossible. Is there a way? I did a brass melt last week and cast a 4# hammer head. I cut the pattern with a wire foam cutter and cut my initials in it with my CNC router. Rammed it up in greensand with a core made from sand and sodium silicate. I got the metal a little hot and, yes, it smoked and had some flames. I put some charcoal on top to cut the flames and let it set to cool before I poured. It came out a little better than expected, cleaned it up and put it on a hickory handle. This was zinc brass with 70% copper and 30% zinc. I like to cast Brass and Bronze and hope to cast some more Iron this fall. It sure is too hot right now to do much in the shop. I've been casting for several years and worked in a steel mill. I use PPE and stay away from the fumes. How do I make a curved funnel out of brass? I am going to make a french horn mouthpiece out of brass. For those of you who don't know the shape, images are attached. My question: how do I make a funnel with curved walls on the inside as shown on the diagram? Can I use a lathe for this, and if so what bit? Does brass give of toxic fumes? I am wanting to make a coat rack for my neighbour so I can. Show her what I am doing. Anyone with suggestions or precautions related to inlay of ironwork or brass in the surface of a concrete floor? Building a new home next summer and I thought something like that would be an interesting highlight. The door handles at my church are plated brass and are now wearing through and the corrosion is looking bad. What is the best way to correct this other than replacing them? Anyone mixed copper and brass? Hey guys howsit going, well ive got a few old welding bits in the shed that are beyond reusing and at the same time I need some pommel, guard and bolster material but don't really wanna use straight brass or copper so I thought of smelting the two together and giving it a few stirs to see if ill get a new color or not. Does anyone know what color ill get by mixing the two? 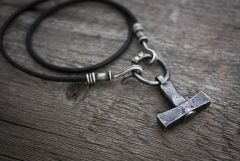 This is a Thor's hammer necklace ( Mjolnir ) I made a while back based on a hammer amulet found in Uppland, Sweden. The hammer and ring are steel, but the oath ring section is riveted with brass and the necklace fittings I made with sterling silver and oxidized them to match the hammer. so recently, i came across an old rr track that goes thru my place, (only bout a halfa mile) and i have a surplus of rr spikes, and i see all thee sites of people making their own steel tongs and such, but right now i cant hope to do that without a welder and drill press present. so a thought occured to me, "why not cast them? "ive casted small aluminum iingot (ignots?) before, and i was wondering how if i did decide to cast this, how to make a mould for brass, ive got atleast 3thousand .22 lr shells laying around in mason jars and such. my only issue is how to make a mould (id buy an actual foundry setup but i have tight money at the moment) i have my makeshift crucible from a 4in. diamiter rd stock steel that i lathed out, my only question to you gents now is: 1. is it even possible to do this with old .22 shells? 2. how do i go about making the mould? 3. would this even be a usable set of tongs?